This is the best and most beautiful dining table and chairs. 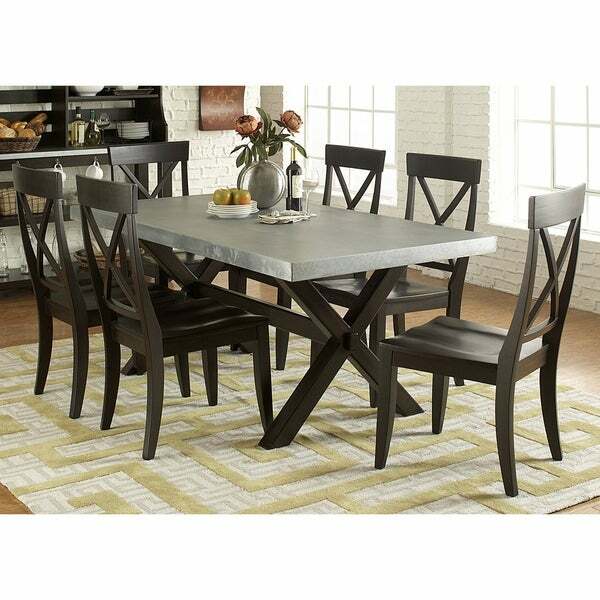 Enliven your dining room with the distinct and distinguished style of this charming dinette set. The zinc table top is paired with a mahogany finish for visual interest and industrial flair, bringing an artful element to your space that you can enjoy for years to come. I love this set - it is VERY heavy and solid - very unique with the zinc top - very happy! Wow! Better than I could have imagined. Great quality. Solid! Love it! loved how different it looks! can't wait to get it! "I am curious what the edges of this table are like? Is there a metal seam? Is it sharp? Or are the edges smooth? Wondering if it might a hazard for small children..thanks !" Hello lohri68, this would be no more dangerous than any other dining room table. Thank you for shopping with us. "does this table top scratch & stain easily?" Hello launa, we can appreciate the fact you want a firsthand account of the product. You will receive an email notification every time you get a response. Thank you for shopping with us. "Is it possible to get just the table? If so, what is the price? Thank You! Coral K"
Hello coralkennedy, this is only available as a set. We apologize for the inconvenience. Thank you for shopping with us! a.c.